Underdog Xenia falls to national power, 89-80. Xenia’s Zack Gaither (3) scores and draws a foul on Isaiah Hoyt of First Love Christian Academy, during third-quarter action at the annual Flyin’ To The Hoop basketball showcase event, Jan. 19 at Kettering’s Trent Arena. 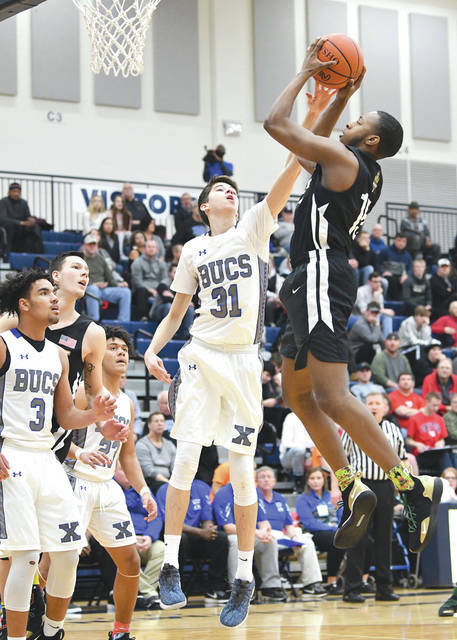 Xenia senior Samari Curtis (15) showed why he’s considered one of the top high school guards in the nation, Jan. 19, as he scored a game-high 44 points in the Buccaneers’ loss to national power First Love Academy, at the annual Flyin’ To The Hoop basketball showcase event in Kettering. Xenia’s Noah Crawford (31) contests a shot by First Love Christian’s Olsen Nicholson, Jan. 19, at the Flyin’ To The Hoop basketball showcase event at Trent Arena in Kettering. KETTERING — Tossed into a basketball showcase featuring many of the nation’s top high school basketball prospects, the Xenia Buccaneers boys basketball team held its own in an 89-80 loss to national power First Love Christian Academy, Jan. 19, at the annual Flyin’ To The Hoop basketball showcase event at Trent Arena. 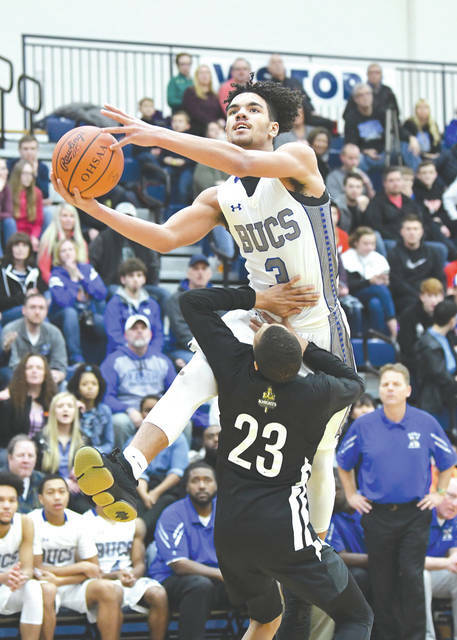 The underdogs trailed by 15 points after three quarters of play, and at one point in the third were down by 17 points (71-54), but Xenia battled back to within seven points of the Knights on the last score of an impressive game by the Bucs’ Samari Curtis. First Love (12-4) hit another score with just over 28 seconds left then ran out the clock for the nine-point win. FLCA coach Khayree Wilson apparently had heard all about Samari Curtis, and he knew the goal was to limit the future Cincinnati Bearcat to as few points as possible. “I thought the game was pretty good. We got up and down, because that’s what we like to do. We like to be a fast-paced team and play hard, and play fast, but Samari Curtis is a heck of a talent, and he’s a lot to contain,” Wilson said. “We knew what he was going to come to the table with, so our objective was to slow him down as much as we can, and control everybody else. Curtis still drained a controlled game-high 44 points for Xenia (7-6), and snagged eight rebounds will dishing out five assists. Jate Bradley came in from off the bench to score 13 points and starter Zack Gaither finished with 10 points and seven rebounds. Xenia coach Kent Anderson said he was very proud of the way the Buccaneers played against a national touring team on the big stage. “I thought our kids competed the whole game,” he said. “We had several chances were we could’ve just rolled over. We were down and just about buried, but our kids kept fighting and found a way to get back in it. There was one possession where we were down about six or seven, and we got a steal. If we had maybe converted on that one, and used a time out, we’d have gotten within five. You just never know what can happen. Wilson came away impressed as well. His team has played teams from Texas, West Virginia, Maryland, Kentucky, Georgia and New Jersey so far this season. “Any time you face a Division I basketball player on the court, it’s going to be a tough game,” Wilson said. “I think our advantage was that we had four Division-I kids on our roster. But Xenia has a heckuva coach, he coached a heckuva game, their players never gave up and Samari played a heckuva game. Future St. Mary’s University player Naim Miller led the Knights with 24 points, Jett Roesing scored 15 points while Jason Eubank and D.J. Gordan each finished with 14 points each. Three-star rated athlete Isaiah Wilson was limited to five points against Xenia. Since 2004, 57 Flyin’ To The Hoop participants have gone on to play in the NBA, and two FTTH players enjoyed NFL careers. The annual event is considered by CBS Sports and MaxPreps as the no. 2 rated national showcase event in the country. 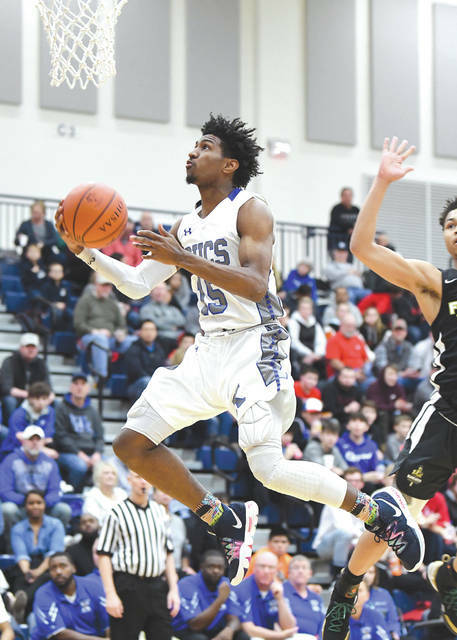 CARROLL GAME CANCELLED: The annual showcase got off to a slight delay when Saturday’s opening girls high school basketball game between the Division II no. 1-ranked Carroll Patriots and the Division IV no. 2-ranked Minster Wildcats was called off due to weather conditions in Darke County. According to Carroll Athletic Director Scott Molfenter, Minster school officials opted to heed the Level 2 snow emergency that had been put into effect for Darke County, and opted not to travel on the hazardous driving conditions. Carroll will return to the hardwood at 7:30 p.m. Wednesday, Jan. 23 when they will host neighborhood rival Beavercreek.